1/3 bar of Fels Naptha soap( is an awesome stain remover). 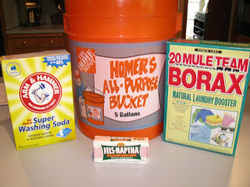 1/2 cup Borax powder(softens the water, cleans, disinfects and deodorizes the clothes, ). 1/2 cup Arm and Hammer Washing Soda( neutralizes odors as well as cuts grease in the fabrics). Add 6 cups of water and heat until the soap melts. Now add the washing soda and borax, stirring until it is dissolved. Pour 4 cups hot tap water into your bucket. Add your soap mixture and stir it together. Add another 22 cups of water and stir to combine. It won’t have a normal consistency. Part of it will be like jello and part will remain liquid. It’s all the same thing and dissolves in the laundry tub. No need to try and break it up. Each load takes about 1/2 cup of laundry soap. By doing this you save a lot of money plus, you are not polluting the ground water and your rivers/streams with chemicals. This in the long run will help us preserve our planet!